God Save the King (Brazilian: Deus Salve O Rei) is a medieval series from Brazil that questions how much of a choice people actually had in their lives back then. The kingdoms of Montemor and Artena live in peace, but a decision changes the course of their destiny. Where can you stream Deus Salve O Rei? On 2018-01-09 Drama/Soap TV Series Deus Salve O Rei first aired on Rede Globo. 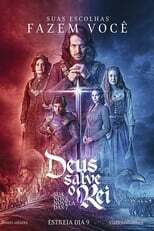 Written and created by Daniel Adjafre, Deus Salve O Rei will return and was last broadcasted on 2018-03-07.